I have so enjoyed the pictures and comments from bloglovin. I was intrigued with the recipe for Dutch Babies. I also make a similar dish. My grandparents came to the states from Finland. And every Christmas I have a Finnish brunch for family. I want to continue providing glimpses of our heritage for my children and grandchildren. I serve kroppsua (like Dutch Babies) except without the vanilla, lemon and powdered sugar. I also make a cardammon bread, vahhto puddua (cranberry whipped pudding) fruit soup and various cookies and candies. We enjoy the gathering and old traditions. I envy your white Christmas. I think we have only had one in the last ten years where I am in Virginia but maybe we will get snow this winter! We also like to watch movies and play games. This year we bought a specialty Monopoly game board for our hometown. I’m curious about essential oils. I’ll read about your starter kit! I quit buying scented candles after learning about the ill effects, but I miss fragrance. Love that you had a white Christmas! We had some white too and it just made Christmas even more magical. Your house looks so cozy, be glad I am not closer or I might pop in for some nog and cuddles with the dogs! Quick question: When you make your own roller bottles, what is proportion of almond carrier oil to the essential oil? Stop It … can it get even more picture perfect, than a glimpse outside your winter into the wonderland adorned in snow?! Sounds lovely! I grew up in Oregon and miss it terribly. As a Soldier I remind myself (especially during the holidays) home is not a place but being with those you love. We live in Arizona, last year we did have snow flurries and our mountains were blanketed in white, this year it was more than 70 degrees, this is life in the high desert. Blessings to you and yours. Just a beautiful day. Lucky you. Looking forward to possibly winning the essential oil giveaway. I feel like the last one on earth to get on board. We had a picture perfect Christmas as well with a fresh snowfall. Fantastic photos. It is such a joy to see real people and real pets in these photos. Thank you for welcoming us in to your home! Your photos and words really draw your readers into the mood and make it feel inspirational. Your tree and living room are gorgeous! We had a white Christmas too!! Yours looks so lovely. :) We have three littles, so post Christmas traditions right now involve playing, snuggling and napping!! White Christmas in Ohio! Merry Christmas from our Teddy Doodle to all of yours! Looks like you had a lovely Christmas! It’s pretty much the same here in Toronto right now. After Christmas I enjoy the fact that I don’t *have* to run around, frantically trying to get everything done. Tomorrow it’s finally time to see Star Wars! Enjoyed seeing the beautiful photos of your lovely home. 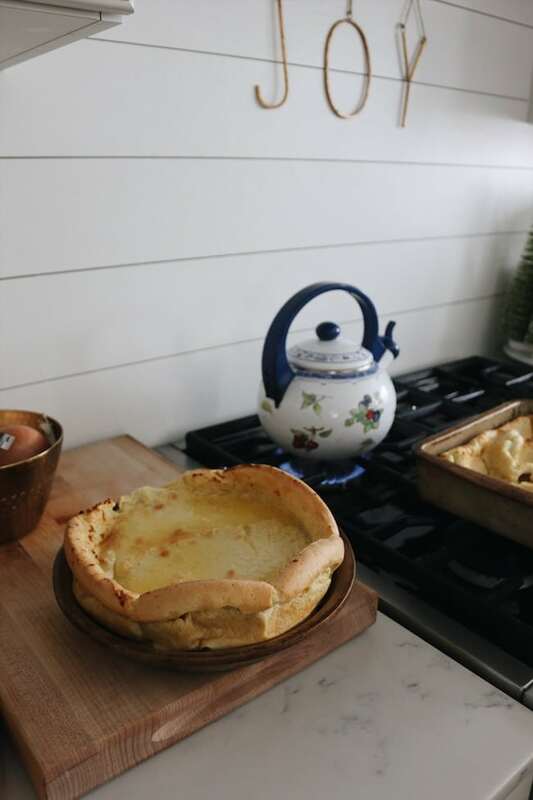 Your Dutch baby looks fabulous. I have always wanted to make one, but never tried it. I think I need to change that. By the way, your dogs are adorable, if ever you get tired of them I’ll take the lot. I really appreciate and enjoy your honest approach to living with your “very real family”. Thank you for your kind invite into your lovely home. I have always thought a Cameo would be so much fun and I know I would label all the things too! Merry Christmas! How beautiful the photos were! Especially loved the pups sitting on top of the pillows just ‘day dreaming’ of the snow. Isn’t that what we humans do? I recently snowed here in South Texas, 2 and 1/2 inches. A REAL treat of us! My husband and I were just mesmerized by all the beauty we were seeing. Your doggie babies are precious! Love your blog and your books – I have them all. Happy New Year. I finally bit the bullet and just ordered the starter kit through you – can’t wait to get that bonus from you although I didn’t see a promo code, so I presume you are just notified somehow? I’m looking forward to adding some essential oils to my life, and hoping they will help me sleep better at night. Merry Christmas to you all, we also had a white Christmas and it was heavenly! Unfortunately I’m back at work today so no jammie day for me, sadly. Enjoy yours! Wonderful!! So excited for you to join us, Debbie!! Thank you. The kit comes from Young Living and the new year bundle comes right from me to you so no promo code needed! You’re going to LOVE the oils! I’m thrilled for you. Ooh, I love blueberry dutch babies, especially on frosty mornings. Your photos are super! White Christmases are a thing of the past for this Canadian girl now living in Phoenix! LOVE your photos! Essential oils have begun to intrigue me since my brother told me about them last year. I have not yet purchased my first set but am planning to quite soon! I am not a snow person, but that does look lovely. So cozy. Post-Christmas, it’s about getting ready for the new year…. planning new year’s eve and new year’s day menus. Just enjoying the time home alone with immediate family, no immediate demands. Lovely photos! 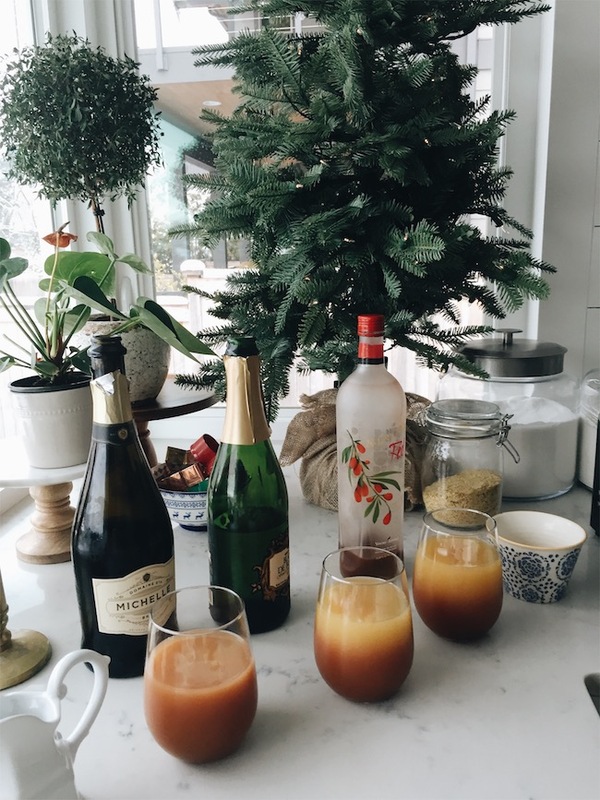 Looks like you had a wonderful Christmas…and I have to make those Dutch Babies. Just beautiful! The day after Christmas, our family plays outside in the Michigan snow, downhill or cross country skis, snowmobiling or sledding. Then it is inside for turkey soup, board games and hot cocoa! We have Swedish pancakes for Christmas morning breakfast. :) Your snow looks lovely! Oyster stew on Christmas Eve!!! Karla, we have clam chowder on Christmas Eve – and in Indiana, not even close to the East coast. I can hardly wait to try the recipe! It sounds delicious! The dog pj’s are always my favorite! No white Christmas for us Florida folks! So I will have to live vicariously through your beautiful pictures. Thanks for sharing with us! I always enjoy your blog and your book was a gift for two friends. We have made the same Ditch babies recipe for generations! They are so yummy! Always love the pup pics! And, the snow is beautiful. We live in Mukilteo so we also enjoyed a white Christmas. We had 14 guests–son, grandchildren and great-grandchildren for our traditional Christmas Eve feast. Your home is absolutely beautiful! Thanks for sharing! Blessed new year! Your home is absolutely beautiful! Thanks for sharing! Many blessings for 2018! Can’t wait to try the Dutch Baby Recipe!! Thanks for adding that in the post. My favorite photos are of the dogs. I think a children’s book of their adventures would be neat. They always have great expressions and seem to be planning the next escapade!! Love your ideas and your blog consistently inspires me…. Merry Christmas to you and your family! going to a movie theatre, and sitting in front of the fireplace! That is the way we enjoy ourselves; between Christmas, and New Year’s. 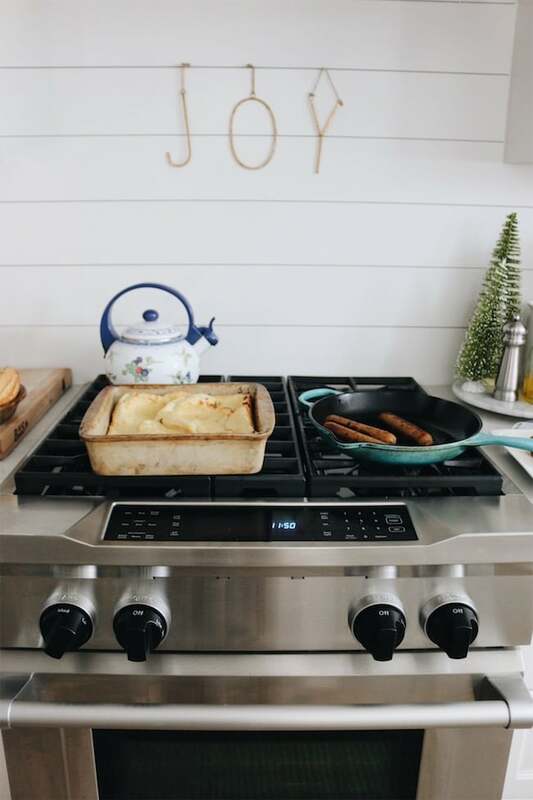 I absolutely love that you showed us pics of your coziness AND Dutch Babies recipe…and now a rollerball entry- whoo hoo! So glad you got to experience a white Christmas! We did too and it was so lovely. I’ve really enjoyed your Posts this season. Those puppies are adorable and although no snow where I live, it sure looked pretty from here. A beautiful white Christmas! Wishing your family a wonderful New Year!!! I do enjoy your posts! You were one of the first blogs I started following, and still one of my favorite! Happy New year to you! We made mini dutch pancakes for the family with each person topping it with powdered sugar, strawberries or blueberries. So delicious! Wondering where you buy or how to make holiday coconut milk nog. We have a lactose intolerant person in the family who loves egg nog. We have gotten the Trader Joes almond milk nog, but it does taste a little different. So beautiful ! I will be trying the Dutch Babies here in good ol Texas ! Beautiful photos! I’ll check out the oils, I’ve been interested in trying them out. You has me at “Dutch babies”! Merry white holidays. Everything looks better with a sweet coating of snow! I heard that you got snow on the other side of the mountains. We did, too. Not a lot, but enough to cover most of the ground. Your pictures look so cozy. Great time to stay inside if you can. Merry Christmas. Fun to see the dogs. We enjoy the antics of our Siamese cats, they are such characters! Wondering too where you buy or how you make your holiday coconut nog. Please share. Happy Holidays! Such adorable dogs and super fun big knit throw! Such great pix of your doodles! Love that you’ve created a lovely home, but not so precious that the dogs can’t enjoy it with you. Dogs make every occasion cozier and filled with love and play! They are soooo adorable, love all their pictures! Jealous of the White Christmas… Adorable puppy pictures!! Beautiful pics! We had a white Christmas as well, magical!! Beautiful photos. I love your wrapping paper, not traditional colors that work so well with your decor. Love the doggies! I love making( and eating) Dutch Babies. I put fruit in mine. I love essential oils. I have chemical sensitivities, so I quit using most candles, commercial cleaners and air fresheners. I hope you will at least do one chapter in your next book on the oils. We got so much snow on Christmas Day. Fortunately I had celebrated Christmas early with my daughter’s family and so staying home in comfy clothes was like I had ordered it specifically. Enjoy your posts, and your photos. May 2018 continue to be good to you and yours. Your home looks picture perfect! The window views of snow make it even more more beautiful! We were blessed with snow three days before Christmas as well as in Christmas Day!! Magical! Our first post-Christmas day was spent enjoying together our new games and movies and snow!!! HAPPY NRW YEAR to you and yours! Happy Boxing Day or Happy 1st Day of Christmas! Thanks for sharing the beauty of your home. It is so welcoming. Bless you! Thank you! Your Christmas sounds wonderful! Can’t wait to try the recipe. What a beautiful view! We got a surprise white Christmas in KC as well – a delight for grandchildren!! 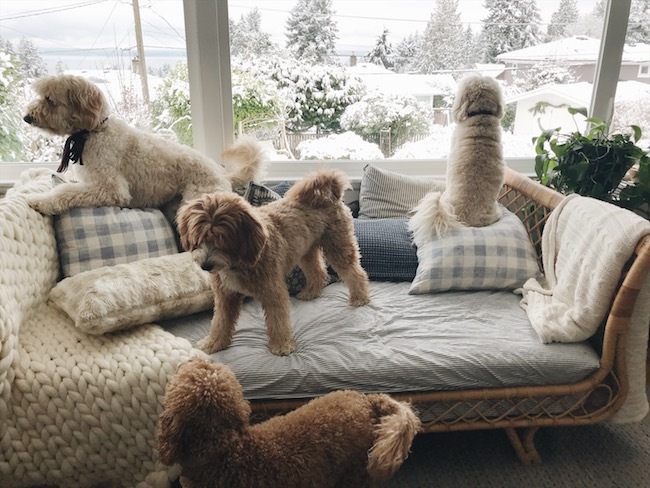 Love the photos of the pups looking out the window. We got snow here in Indiana on Christmas Eve day also and my two dogs, one of which I rolls on her back and I swear makes her version of snow angels, absolutely loved it. I was home and not on the road that day, so I loved it too. Our real Christmas tree didn’t stay alive very long this year so I was eager to clean up as soon as possible. As an oil newbie, I followed one of your suggestions for blends and diffused Peppermint and Stress Away—wow!! It made clean up so enjoyable and I never thought I’d say that!! Merry Christmas! We also had a white Christmas! We love watching the birds come to our feeder and suet blocks. The cardinals and woodpeckers are so beautiful with the new snow. Your home is beautiful! We live north of you on Camano Island. It was a beautiful white Christmas here too. Have been experimenting a little with essential oils and found that a recent flight to NYC without my evening oils and diffuser made me miss them……I have gotten used to different oils to sleep or fight congestion……more research needed. Glad to be home where I can get the diffuser going. I like that you include Ningxia with your alcohol. It’s a really nice mixer. I like it with vanilla vodka. How wonderful that you got your wish. We in the far North of Ontario do not have this fear of a green Christmas, LOL. We have so much we can share with anybody. I do wonder why we Canadians are not eligible for giveaways though? Is there some odd rule we do not know about? I thought the Dutch Babies had something to do with your Dutch doors! I’ve never heard of them before! They sound delicious, though. And now I sound like a cannibal! Oh my… I will try the recipe, though. Thanks! And happy new year to you and your family! My husband and daughter enjoy working on puzzles during the holidays. 😊 We will also watch lots of movies. Love the pups! So glad you had a white Christmas, nothing better! Fortunately, our Christmas was quiet and not white (ankle surgery this week so no need for icy conditions;). However, a lovely time with family and our homemade delicious recipes – we look forward to this all year long (prime rib, risotto, cranberry bars, etc.). Having snow arrive on Christmas is the greatest! We also had a white Christmas here in the northeast. We really don’t have any after Christmas traditions other than getting things put away. We also enjoyed Seattle’s snow this Christmas. We live about 20 miles north of the city and spent the day as a family. Priceless! Absolutely beautiful! I love fresh fallen snow. Love all the pups. they are so cute. I love the throw on the sofa. I thought about trying to make one but don’t know exactly where I’d find the yarn. Can you tell me where you got it? All we got was snow flurries, but it was enough for my little fur baby to go out and have fun chasing them, he really loves it . He can jump in a snow drift and be completely covered and come bouncing out so happy and he never shivers. I am going to try your recipe in the morning, thanks for sharing it with us. We woke up Christmas morning to a beautiful white Christmas here in western Massachusetts, as well– so picture perfect! Your home is warm and beautiful and I share your love of doodles– ours is so loved and he truly makes our house a home! Thanks for sharing all of your great ideas with us readers. Love the white Christmas makes it look like a magical winter wonderland! The labels are cute! I love my diffuser I feel having it with lavender before bed helps me to rest better!! The dog cousins are my favorite part of your post. What amazing companions and gifts dogs are! Love following you, your family and the pups! We had a bit of snow on Christmas also! Oh and thanks for the recipe! Going to try it! Snow and Dutch Babies what a perfect combo for Christmas! I’m so glad you got snow for Christmas. It makes Christmas that much more magical. We also got snow on Christmas. My hubby had to work all Christmas but we got to enjoy the evening together. Your Dutch Babies look amazing and I am a huge fan of essential oils. I use them a lot. Hope you and your family have a happy New Year. Absolutely beautiful pictures. Looks so warm & cozy. Blessings to you & family. I am going to enjoy trying your Dutch Baby recipe, thank YOU! Our family loves Dutch Babies with syrup and apples! Thanks for the inspiration, will make one this morning. Thanks for the recipe..and may you and yours have a blessed New Year! We moved from Portland to Amity this summer and, of course, didn’t get a lick of that snow. It looks so pretty! The Dutch Babies look delicious! I can’t wait to make some, thank you for sharing! Always enjoy reading your posts and books! We had a white Christmas in Portland, too. And yea, Dutch Babies are a family favorite. Wishing you and yours a happy, healthy new year! So happy you got a white Christmas! We were close down here in Salem…but not quite. 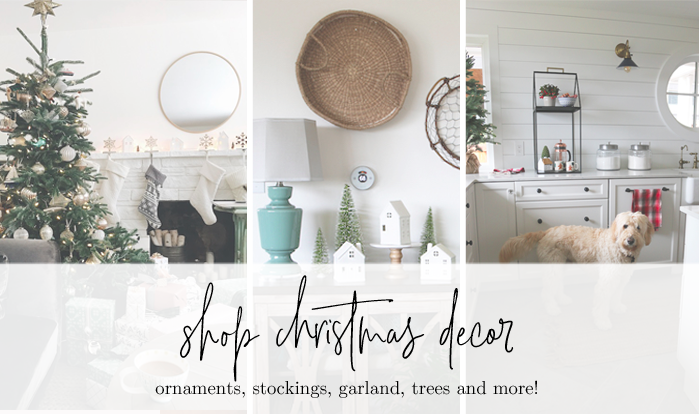 This is our first Christmas in our new house and I have enjoyed decorating in new ways and spaces! 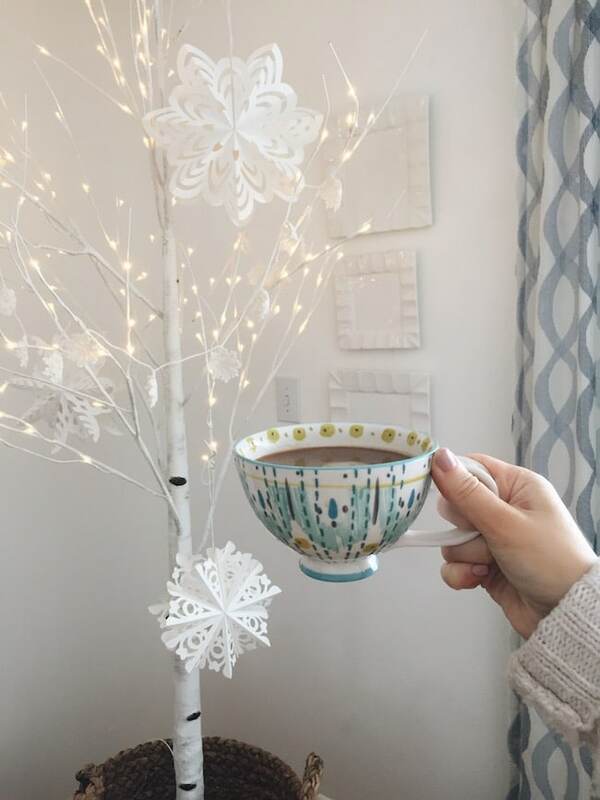 We had a white Christmas here in Kansas City too which isn’t the norm…so cozy! We live in Portland and were just as thrilled to have a white Christmas! What an unexpected treat! I’m on the west slope of Tacoma…similar view!! Merry Christmas!!! It looks like you had a wonderful Christmas. Have a blessed New Year, as well! I love seeing the photos of your dogs and your beautiful home!! It looks so warm and inviting! The big question is, who gets the lone grey stocking? Jack? :) I have been diffusing Christmas Spirit and loving it.. puts you in the holiday mood! Thanks for sharing your lovely life with us. We usually head to the movies on Christmas night. It’s been a habit for years. Love all you do -your style, your decor, your photos and your blog! What breed are you dogs – they are adorable!! Thanks for sharing your recipe, I plan on trying it out right away. 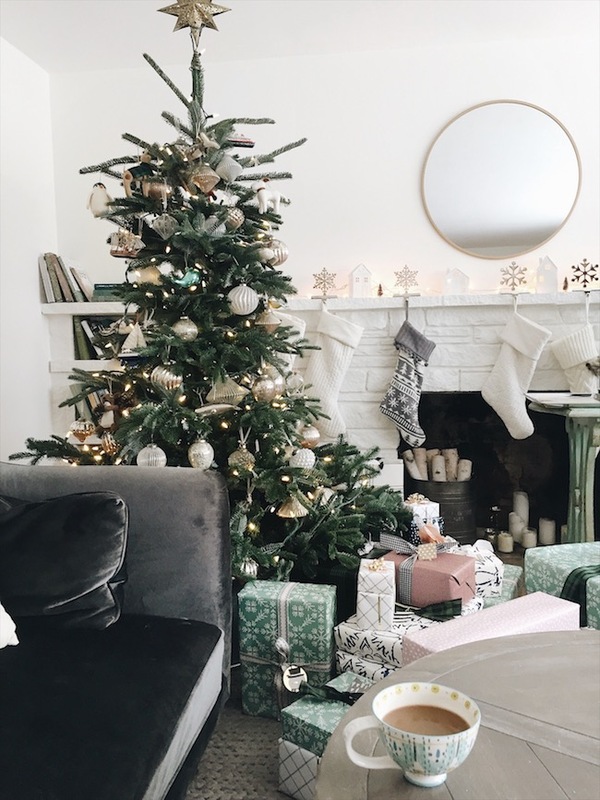 Thanks so much for sharing your beautiful Christmas pictures too! Dear Melissa! Thank you for taking me down memory lane with the cute photos of your pups looking out the window at winter wonderland. We recently moved to TX leaving a similar picture window. Our lovely former Havanese, Mickey, loved to sit looking out the window on similar window days watching deer roam by or searching for food in our yard. Once I snapped the cutest picture of our 2 year old grandchild sitting next to Mickey taking in the snow scene. You’re have a gift for relating gorgeous peaceful settings. Thank you for the reminder from someone missing the snow! Thank you, Jan! I’m glad you enjoyed it! Happy New Year! Lovely photo’s, as always. Loved the coffee/tea-cup (Anthropologie?) 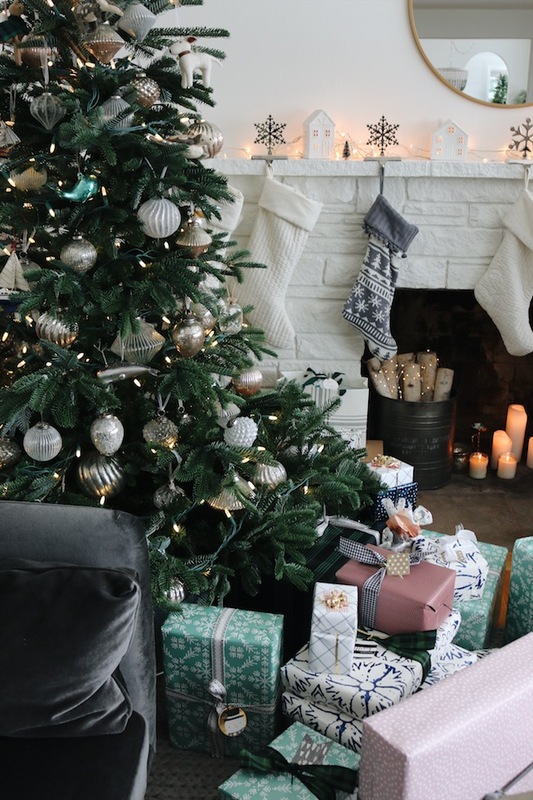 and the color-coordinated gifts underneath your tree. For Sinterklaas, that is our Dutch Secret-Santa, I was gifted “Simple Gatherings”. It is beautiful and I like the greens you picked. I am slow-reading it, to stretch the experience and learning from it… Wishing you and your family holidays full of Grace & Joy and a happy 2018. All of our Christmas decorations were in a different state in preparation for our move, so it was pretty sparse at our house. Enjoyed seeing all of your Christmas pics. No snow for us in the Valley of the Sun. Thanks for sharing your white Christmas! 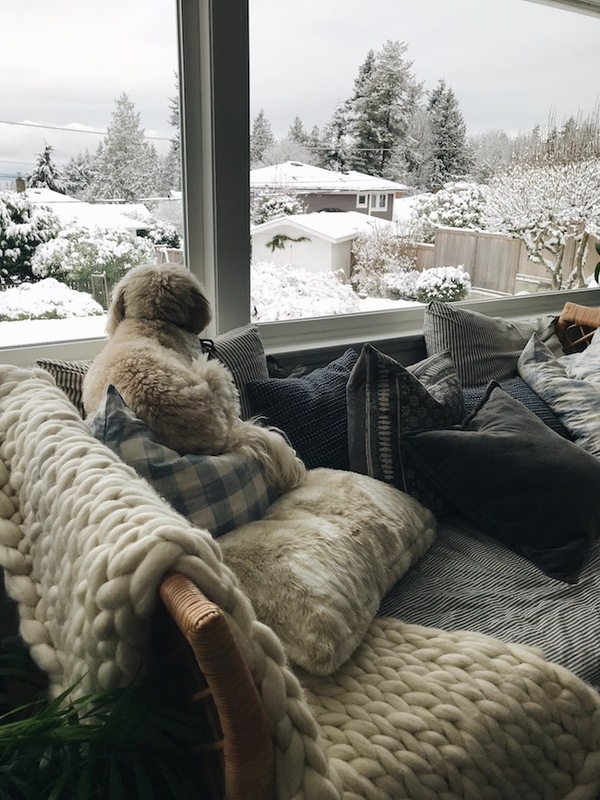 I love seeing dogs looking out the window and this is an especially sweet photo.